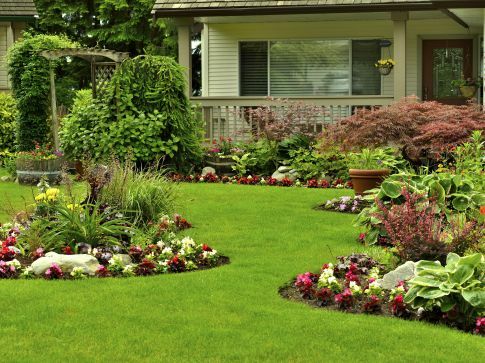 « Is Landscaping a Good Investment? Cool of your yard with some awesome landscaping. Did you know that you can turn your yard into a cool place to hang out with some clever landscaping? Well, you can. Utilizing a few techniques, you may even be able to cut the air off for a few hours and enjoy the benefits of a lower energy bill. It’s worth a shot, right? Well, let’s learn a little more about cooling your yard using landscaping and you can decide for yourself. Here we go! Build your structures with cooling in mind. Trees are going to cool your yard like nothing else. If you want to keep your home and your yard cool and comfortable then you’re going to need the help of some trees. Trees in front of windows can help block the sun from your indoor spaces. If you choose to plant trees that lose their leaves, the windows will be free to let light in during the winter months and you’ll be able to absorb the warmth. If you’re feeling particularly crafty, you can create a wind tunnel using trees on both sides of your home. This will provide your yard with tons of pleasant breezes to cool you off in the summer. Ready to use landscaping to stay cool this summer? This entry was posted on Friday, July 10th, 2015	at 5:47 pm	and is filed under Landscaping Design	. You can follow any responses to this entry through the RSS 2.0	feed. Both comments and pings are currently closed.